Welcome to 282 Cameron Loop. This 2919 model features 3 bedrooms and 2 and a half baths. Walking in to the main entry you will find off your your left a spacious study and a wonderful seating area that opens up into the main living room, dining and kitchen. 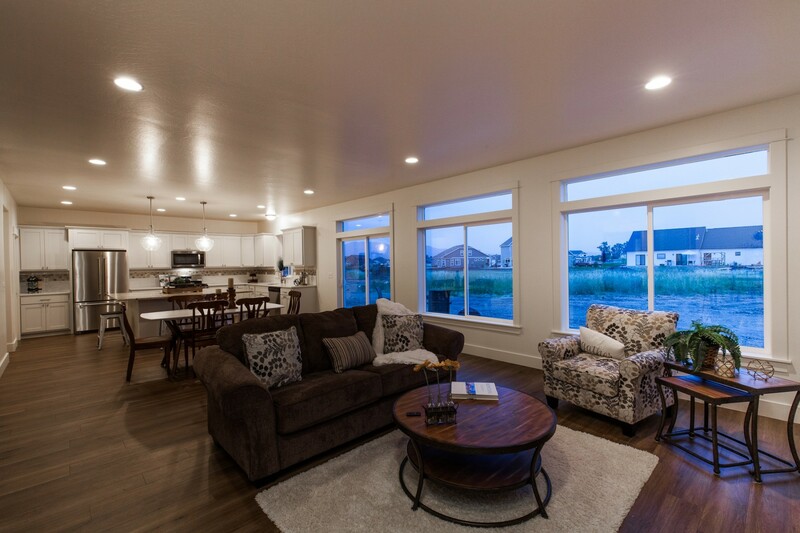 As always with a Sunrise home, this house features a great open floor plan. This house has one of the most spacious of our plans with a massive kitchen and unobstructed views into the living room through the dining. The kitchen itself features a grand dining island for prep-work, stainless steel appliances and a beautiful tile back splash. The counter tops are quartz on the parameter and granite on the large island to not overwhelm the space. Above the island are two large seeded glass pendants to illuminate your work surface and add more glamour to the room. Off to one side is a large walk in pantry. Through the adjacent hallway you will find the powder bath. This hall connects to the garage, making bringing in groceries that much easier. Upstairs you will find a large loft space with ample room for family games, a large TV and room left over for a pool table or ballet studio. All three bedrooms are located upstairs with one being off the front of the house and the others on each side of the back of the house. The master is located on the back corner of the house with views of the mountain ranges from all its windows. The master bath features a beautiful two tone tile shower with white cabinets and granite counter tops. Located on a 1/2 acre lot this home has amazing views of all the mountain ranges surrounding Bozeman including the Bridgers, Tobacco Roots, and Spanish Peaks. The front yard landscaping has been completed, including sprinkler system and drip lines with room to add more for the back. All together this is a great home that is sure to fit your families need's. Hit the link at the bottom of the page to get a personal tour!